This one pot chicken and bacon orzo soup is perfect for chilly days or when you just need a warm, tasty bowl of comfort food in the evenings. It’s quick and easy to prepare, using Orzo, a form of short-cut pasta, shaped like a large grain of rice for some added texture. 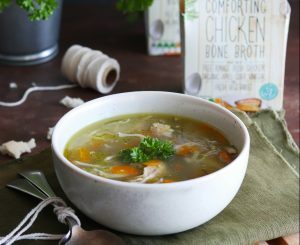 Our delicious bone broth seals it all nicely, enhancing the already the delicious flavours. In a large dutch oven or heavy bottom saucepan, render the fat from the bacon over low heat. Once there’s a nice layer of fat on the bottom of the pan, turn the heat up slightly and cook the bacon until crisp. Place the bacon on a plate lined with paper towels to drain. Discard all but 2-3 tablespoons of the fat from the pan. Add the onions, garlic, celery, and carrots to the pan with a pinch of salt. Lay the chicken breasts on top of the vegetables and cover with the chicken stock. Bring the liquid to a boil, cover and reduce the heat to low. Allow the soup to simmer for 20 minutes. Remove the chicken and place on a cutting board. Once it has cooled slightly, use two forks to shred the meat. Set aside. Bring the soup back to a boil and add the orzo. Cook for 8 minutes, until the orzo is al dente. Add the chicken back to the soup and season with salt and pepper. Garnish each bowl of soup with fresh parsley.